I arrived early Sunday with the notion that I only heard and wrote about Soluto before. Here I was, standing in their very impressive offices with their impressively friendly staff…WINNERS…(of the TechCrunch Award 2010). I was surprised how little I knew about them, knowing so much about them; their attention to details, for example; how important it is to them that their customers ‘get it’, how everything interacts in their environment…even Granny, and more. Dropbox is a free service that lets you bring your photos, docs, and videos anywhere, share them easily and back up your important stuff. You’ll always be able to access your files, no matter where you are, through Dropbox. Not everyone knows how to install Dropbox and set up their own account, so why not help the people around you get started with Dropbox? With Soluto you can set up Dropbox for your family, friends, and colleagues so they can start sharing and accessing their stuff, from anywhere. If the people you help already have a Dropbox account, you can sign them in. If they don’t, you can create a new account for them, remotely download and install the app onto their PC, sign them in and send them a user guide, all through Soluto. Every Dropbox account you create can store up to 2GB of stuff for free. And, if you create Dropbox accounts for your friends using your Dropbox referral link, not only will they get 2GB of free space, but you’ll both get 500MB of extra space added to your Dropbox accounts for free. You can get up to 32GB of bonus space by adding people to Dropbox. So start setting up Dropbox for all of your friends, and watch your own Dropbox grow! All you have to do is enter their Dropbox account details and click. Soluto will take care of the rest. 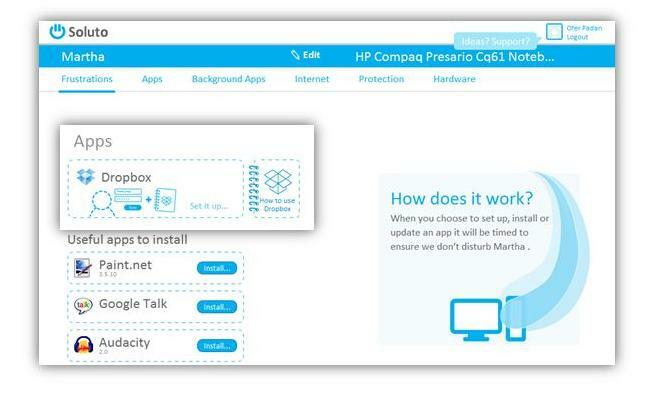 Even if their PC is turned off, the Dropbox installation and login will happen the next time the PC is back on. It’s that easy. The Dropbox account is all ready to go. 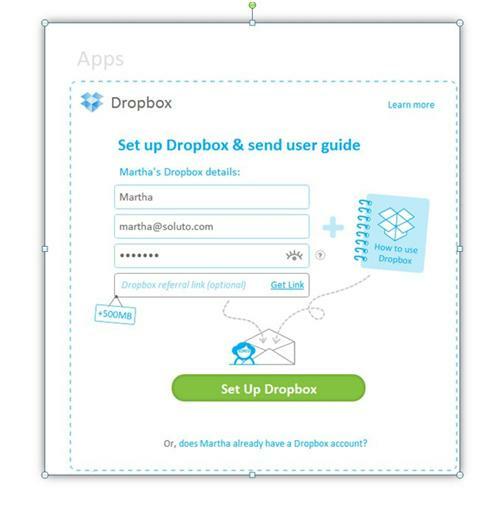 To learn more about the stuff you can do with Dropbox, check out our Dropbox guide. We send this guide to every person you set up on Dropbox to help them get started with the new account you got them. What happens if Dropbox isn’t installed on their PC? No problem, you can easily set up Dropbox for someone else. 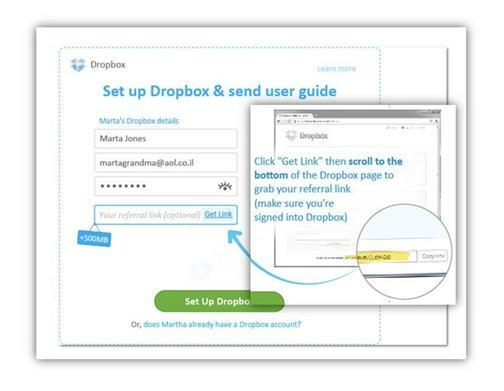 With just one click you can remotely download and install Dropbox for someone you help and sign them in so they’re up and running. How do I get an extra 500MB? Can Soluto see the Dropbox passwords I use? For every Dropbox account you set up a password is auto-generated by default but you can choose a different one if you want. The auto-generated password is in hidden format, but clicking on the eye icon will show you the password. Passwords are not stored on Soluto’s servers and cannot be accessed or seen by anyone at Soluto. If I set up Dropbox for someone else, how will they know what password I used? When you set up Dropbox for another person, you have to enter (or auto-generate) a password for them. You are the only person who sees this password. The other person doesn’t need to know their password to use Dropbox on their PC. 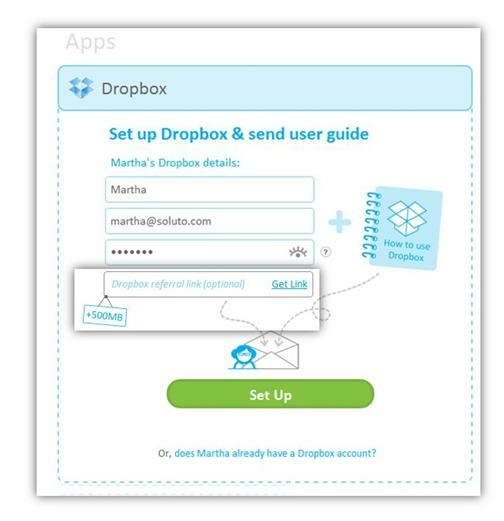 Soluto signs them in locally so when they want to use Dropbox they are already signed in and ready to go. 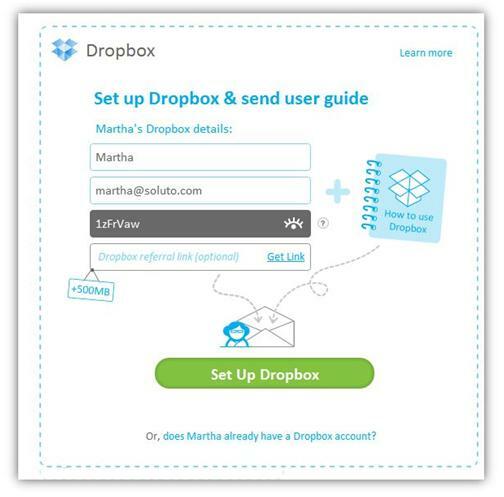 Soluto sends an email to the person you help to let them know that you’ve set up Dropbox for them. The email doesn’t give them their password but it encourages them to change it for their own privacy and explains how to do so. If they choose to change their password you will need to ask them for their new password if they need your help to sign them in again (but that shouldn’t be necessary). Will I have to remember all the Dropbox details and accounts I set up? Once you sign into an existing Dropbox account or set up a new account, the email and password of that Dropbox account will be securely stored on the supported PC. If you set up multiple Dropbox accounts on the same PC, it will only remember the email and password of the last Dropbox account that you set up. Dropbox emails and passwords are never visible to anyone at Soluto and never stored on Soluto’s servers. Please note that the person you help will receive an email from Soluto letting them know that you have signed them into Dropbox or set up a new Dropbox account for them. They will be offered the chance to change their password for security reasons. If they choose to change their password you will need to ask them for their new password if they need your help to sign them in again.